Manila, 11 October 2017 — To help you change, would you prefer to feel pushed or pulled? As leaders, our challenge is to influence change in our workplaces and our world around us. To lead change is tough. Almost always, it starts by changing ourselves. To transform first, to be the change—as Gandhi famously said—before helping others to change. I have a question for you. When you are looking to change yourself, would you rather feel pushed or pulled to change? Take a few minutes to think about this. Note down about some times and situations in your life when you felt that you were being pushed to change. It could have been by your boss, or by your partner, or by a reorganization or new rule introduced in your workplace. What happened, what did it feel like to you, and what was the result? Now, think about some times and situations in your life that you felt being pulled to change. Consider who or what was pulling you, and make a note of that. What happened, what did it feel like, and what was the result for you? Have you come to an answer? From my experience in workplaces, including my own personal experiences, I found that when it comes to making a change happen, most people prefer feeling pulled over feeling pushed. Is that your preference too? I would love to hear from you about the situations you reflected on, and the preference you came to. Feel free to write me about it. In contrasting the feelings of being pushed versus being pulled, I am not implying that one of these two is always more effective or the only one that works when you have to change, or when you lead change. In my experience with leadership, there never is one solution that works best in all situations. There is, however, an important lesson in this distinction, which is why I am sharing it. In our efforts to bring about change in our workplaces and the communities around us, it is easy for people to get overwhelmed by the challenges and lose sight of why the change is needed in the first place. This happens a lot in workplaces, and especially when workers feel that they have little voice and are not being listened to. And when people get overwhelmed, they easily get tired of change and tired of talk about change. At some point, they can lose all enthusiasm for change, even if they had it before. Have you seen this happen? I am pretty sure that you have. When it comes to that point, people can develop an allergy to feeling pushed to change. I remember facilitating a retreat where I was asked to please not talk about change. The staff had been talked to by their bosses about change for many months and were tired of feeling pushed, I was told. Talk about something that is exciting and energizing and that brings us together, I was asked. What was happening there was that the participants were looking for a pull factor. Sure, they probably realized that there was a need for change and that this would not go away. However, they just wanted to regain a feeling of excitement in their work and their workplace. How does this sound to you? Familiar? Have you been in such a situation? Many workers have been there and have seen and experienced this. And many leaders whose job it is to promote change can easily forget how easy it is to fall into this trap. Where people develop an allergy to change and to talking about change, they might experience a burnout in their work, which pushes positive results further away. They are stuck. In other places, people might also be stuck, because they have not been challenged for some time about healthy change. Time for a leader to step in and make them step up! Of course, some other workplaces can be seen to be buzzing with activity, which could easily be mistaken for healthy changes taking place. Maybe they are, or maybe people are running around with busyness to avoid change. We're too busy, don't bother us, we don't have time for change! 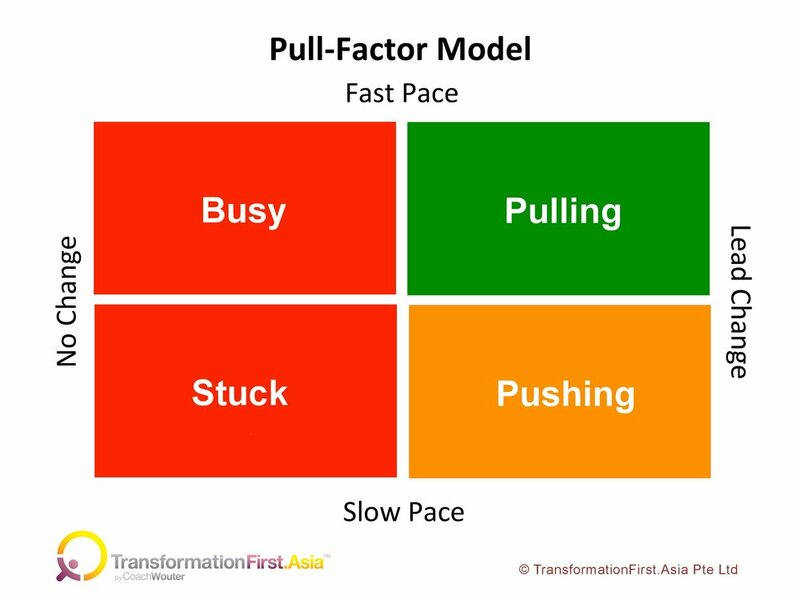 Such situations are shown in the figure about what I call the Pull-Factor Model. When we exercise our leadership, we like to envisage ourselves in situations on the right side of the four quadrants. Hopefully, we are indeed already there. If we are, the question is whether we are pulling or pushing for change, and which of the two is most appropriate in the situation. Have you considered how staff feel, pushed or pulled? If staff feel pushed to the point that they are getting tired or overwhelmed, the pace of work and change will definitely slow down. In that situation, what pull factor can you introduce to help them forward? When change is seen as a huge challenge, what can you do to help staff overcome their hurdles, their tiredness, their doubts, their criticisms, and their excuses, like "we tried that before and it didn't work"? I believe that in many work situations, leaders should invest more time looking for pull factors to bring about the change they want to see. Pull factors to make the change more attractive, exciting, rewarding, and relatively easy to engage in. And if change has become seen to be drudgery in a sea of excuses and complaints, it might be that introducing pull factors can still turn the situation around into a much more healthy dynamic. If you answered the question I asked you by answering that you prefer feeling pulled over feeling pushed, you can now make sure that the people you lead in change will have the luxury of that choice too. Give them a pull factor!